‘Tis the season to celebrate! The holiday season is upon us, and it is a time to make merry! It is a time to give thanks, to celebrate with loved ones, and to enjoy long-held family traditions. Maybe this year you’ll even create a few new ones! 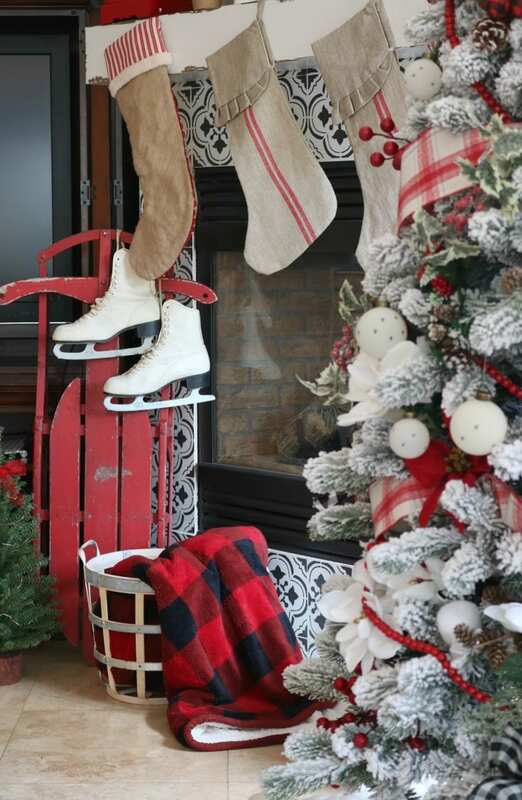 Decorating our homes is how we set the stage for all our festivities. Whether we are hosting large parties, intimate gatherings, or simply celebrating with our families, our homes play an integral part in our enjoyment of the holiday season. 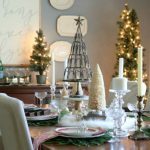 Jodie and I want to share some of our Christmas decorating ideas to help inspire you to create joyful rooms that invite and add magic to your Christmas season. This post is sponsored by our brand partner Tractor Supply. 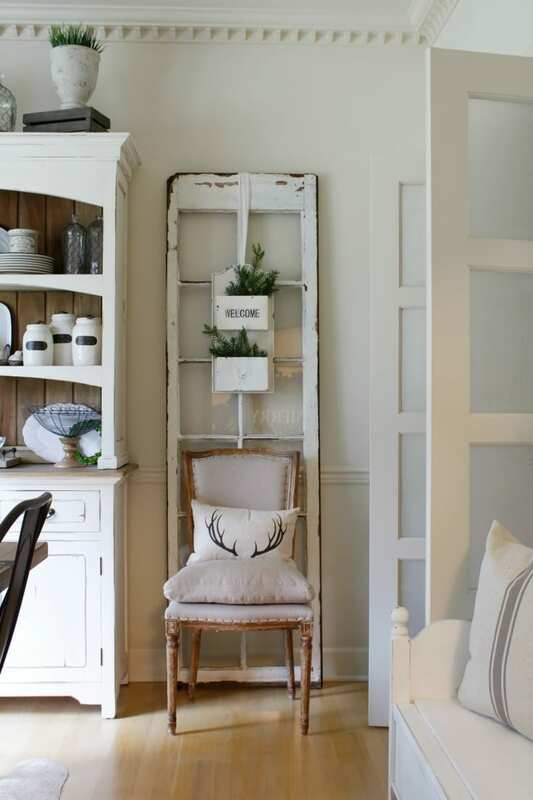 We love their wonderful collections of farmhouse, antique-inspired decor. We are so excited to share some of their delightful home decor items with you. While this post is sponsored, all the views and opinions are entirely our own. We hope you enjoy! Give your home a cohesive look by choosing a theme or mood. 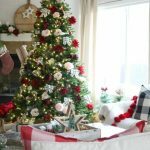 Some examples are country, rustic, farmhouse, vintage antique, red and green traditional, white Christmas, elegant glam, blue and white, and pink. Choose your mood and define your colors. This is always a good way to begin. Some people choose to create themes by room, which is also perfectly acceptable. But each room or space should definitely work together. 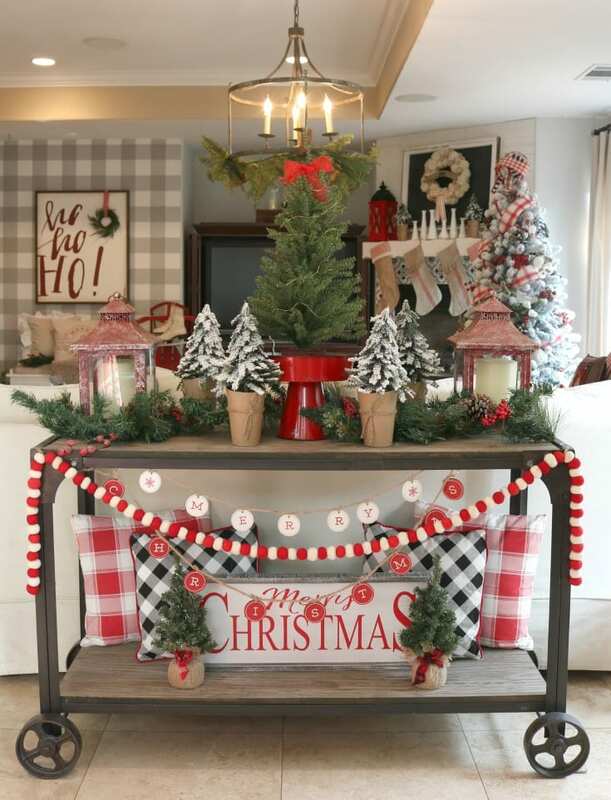 For example, for my family room this year I chose farmhouse country Christmas theme with lots of pops of red and tartan. In my entryway I carried the farmhouse theme, but I kept the colors green and neutral. Above you can see my abundant use of reds and plaids to create a festive mood. I added plenty of faux evergreens to add a rustic Christmas feel. 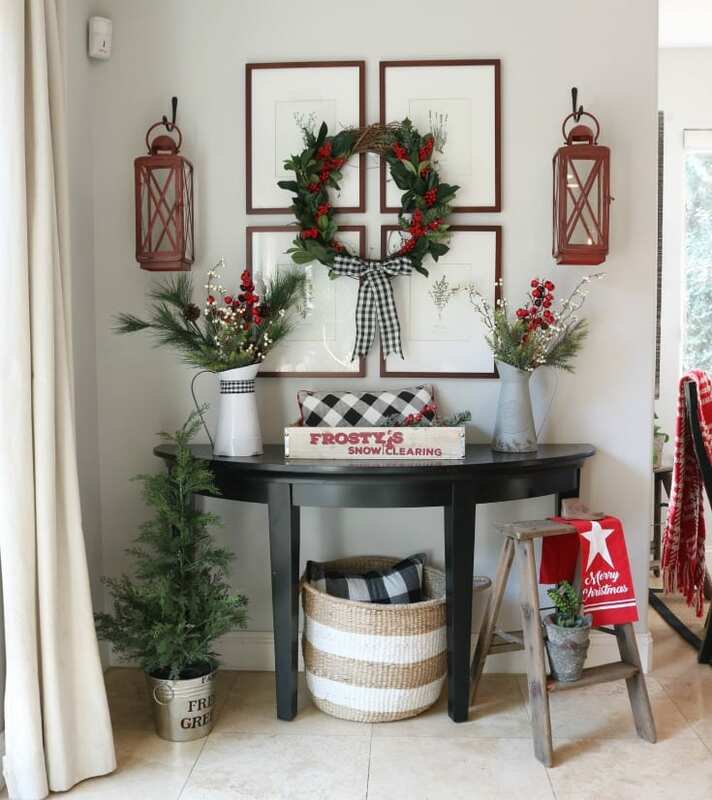 The vignette on my coffee table is created using a hand-made wooden tray, a couple pine cones, a faux evergreen branch and the focal point are these darling rustic metal Christmas trees from Tractor Supply. 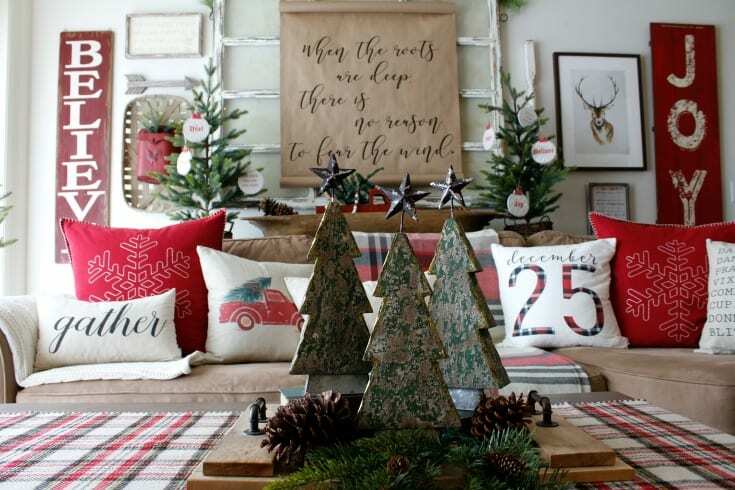 The trees are from the Trisha Yearwood Home Collection sold exclusively at Tractor Supply. I know I will be getting plenty of use from these trees year after year. Shop the unique festive trees HERE. From this close up photo you can see the beautiful details that make these trees so special. 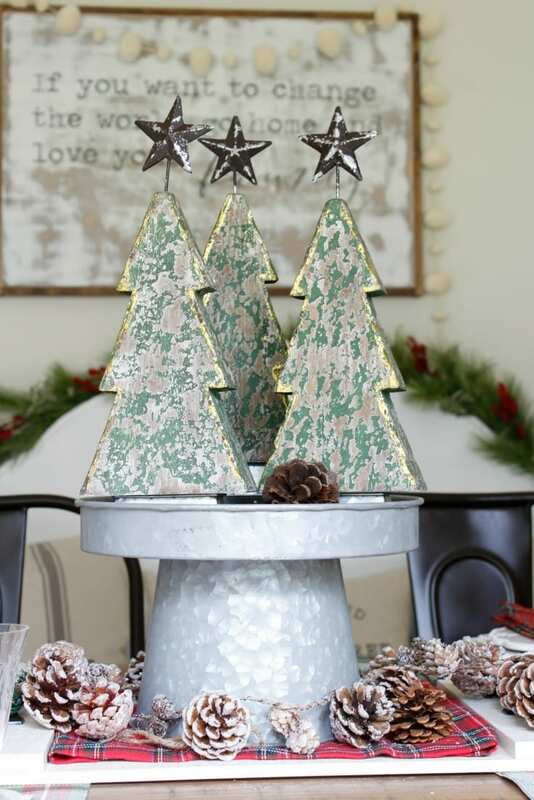 Rustic galvanized metal covered with evergreen color and edged in gold. The combination of colors is eye-catching and gives them plenty of unique texture and interest. I LOVE them! EEK! 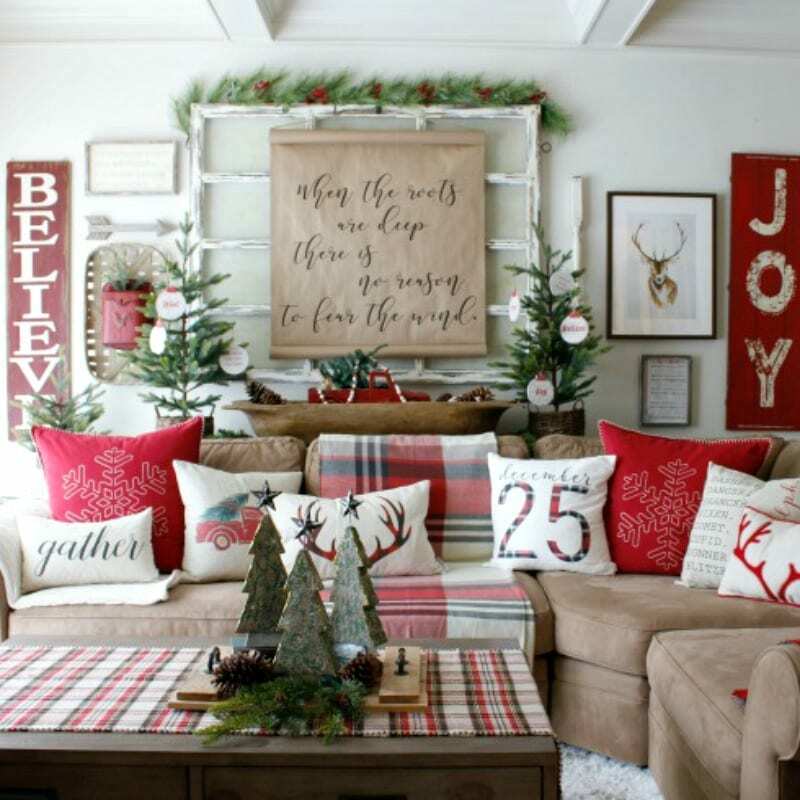 Whether you choose farmhouse style, country Christmas, antique, vintage or traditional styles, Tractor Supply has oodles of choices for all these trending decorating styles. Two favorite brands they carry are the Trisha Yearwood Home Collection and Red Shed. 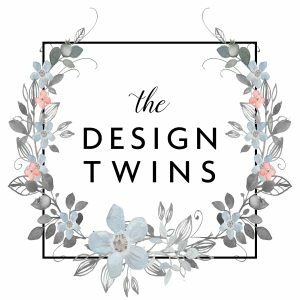 These two brands alone offer hundreds of well-priced, on-trend and delightful decor items all in one place. Jodie and I couldn’t believe the selection when we started browsing. And it’s not just for the holidays. They have equally darling choices for every home, every season. A couple more items I chose from Tractor Supply are shown here. 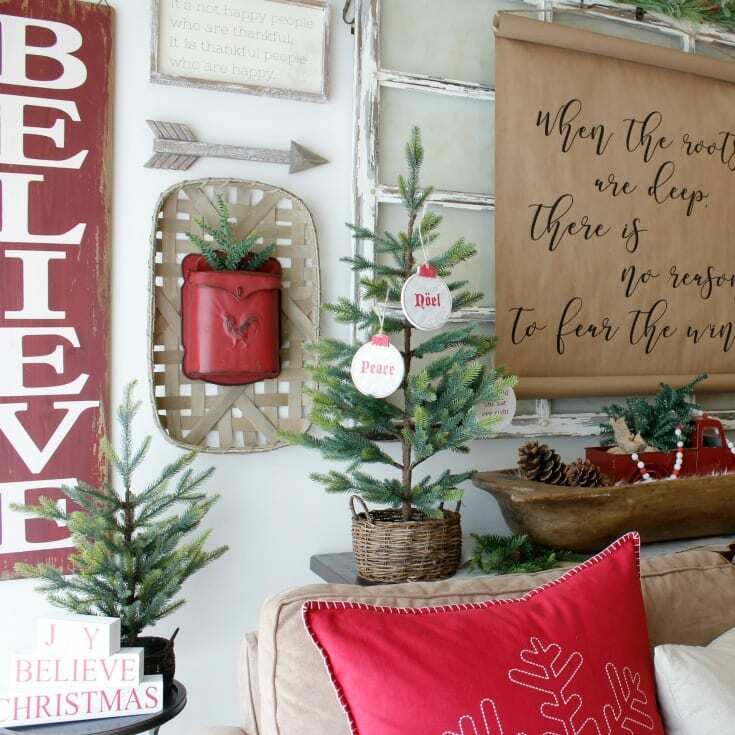 The rustic red wooden “believe” sign adds so much to my holiday gallery wall, made by Red Shed. Right next to it hung inside my tobacco basket is my vintage metal rooster-detailed red mailbox also made by Red Shed. This mailbox is too cute to put away after the holidays. I’m going to have to find a spot for it year-round. Shop the “believe” sign HERE. And shop the red rooster mailbox HERE. 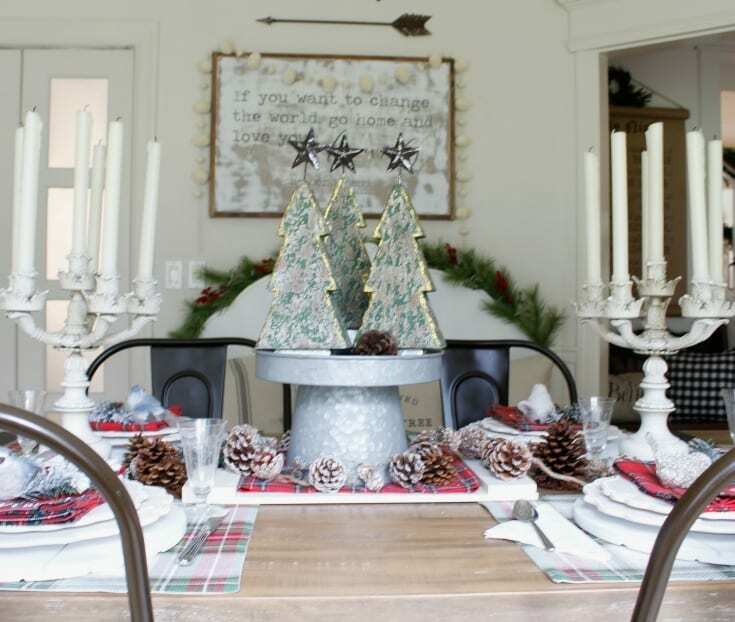 I used another set of the rustic Christmas trees as a focal centerpiece for my holiday table. They are sitting on a galvanized metal and wood display stand also from Tractor Supply. Attention to detail is evident in each of the decor items from the Trisha Yearwood Home Collection from Tractor Supply. 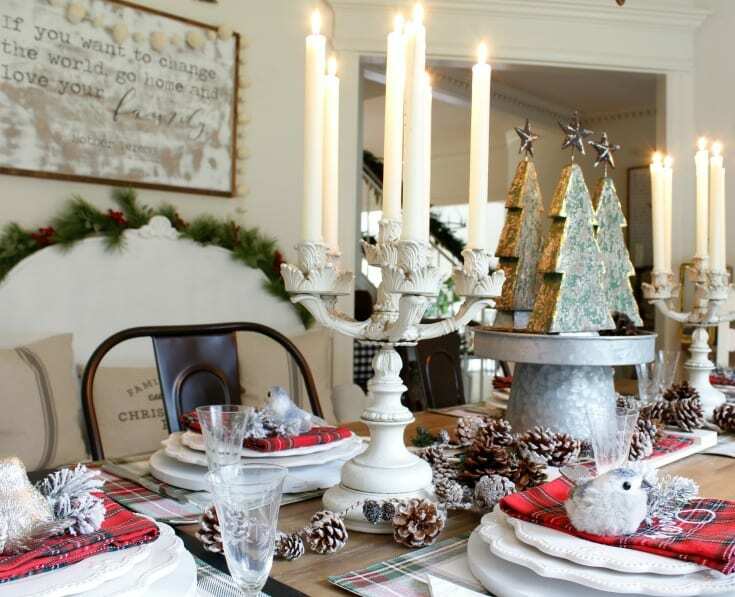 I can see myself using this metal pedestal stand in many seasonal vignettes. It’s going to be a very versatile piece that I’m excited to have fun with all year long. Shop the wood and galvanized pedestal HERE. 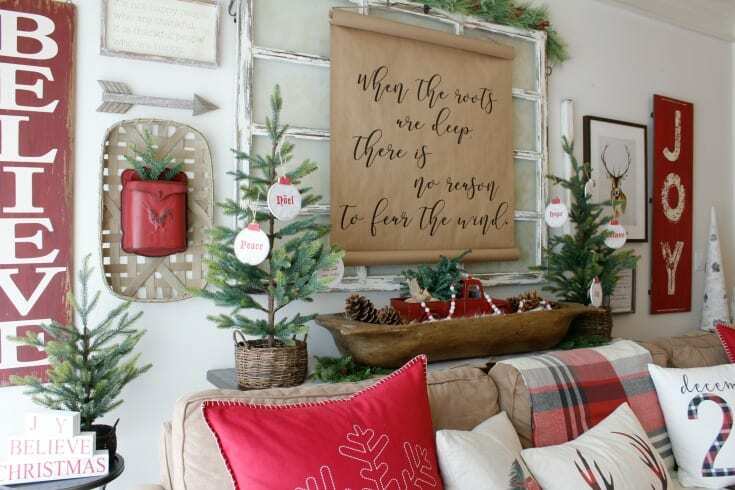 Tractor Supply carries exclusive items from the Trisha Yearwood Home Collection which have a uniquely Southern, farmhouse flair that is close to her heart. Jodie and I have to say not only are we fans of her music, now we are fans of her style. She is one talented lady! Even my husband who is a big country music fan was excited to learn these new home decor pieces were created from the one and only Trisha Yearwood. (Gotta love it when Fred gets excited about decor!) Shop her exclusive Tractor Supply items in stores or online right HERE. Another new favorite decor item, which I know I’ll be having fun with all year long, is this vintage-inspired metal 2 bin rustic wall organizer. I love its shabby chic style and timeless appeal. 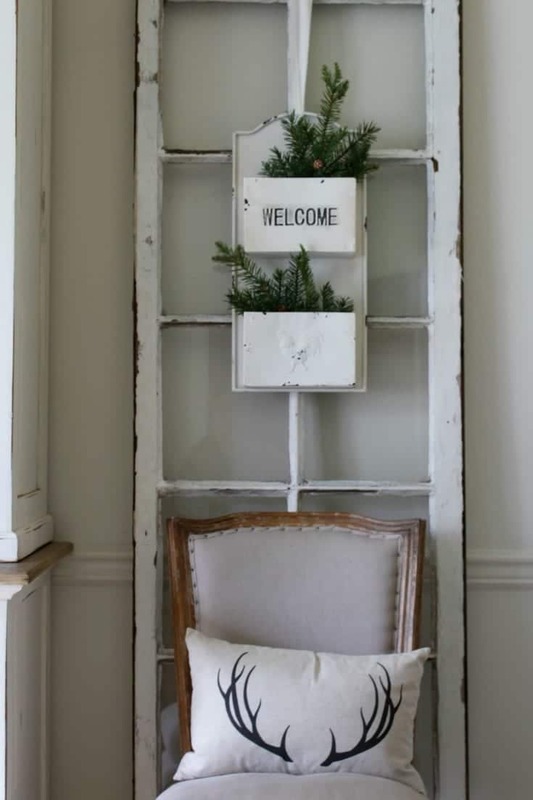 It is perfect for farmhouse decorating year-round. It might be used in a mud room to gather incoming mail or in an office area. I decided to think outside the box and use it to decorate this vintage window pane. It’s uses are endless. It is made by Red Shed and sold exclusively at Tractor Supply. You can buy yours HERE. Red Shed is Tractor Supply’s exclusive home decor line. This unique collection is designed for the rural-loving, farmhouse-inspired homes, which of course Jodie and I love! They are quality made and still provide charming style at a low price. View their collection in stores or online HERE. 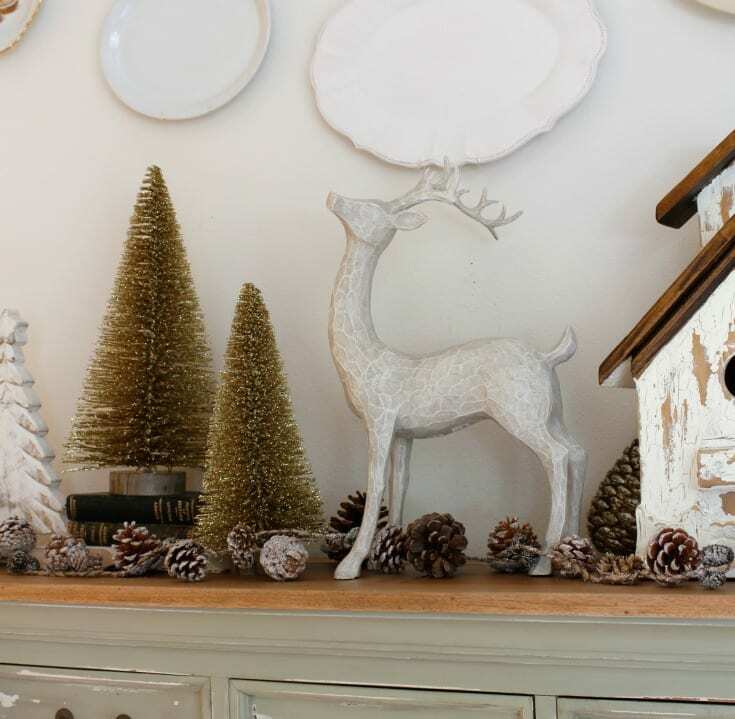 These incredible white rustic wooden reindeer added the perfect accents to my farmhouse style “woodland vignette” on my entry hall table. Simple, elegant, and perfect for the holidays through the winter months. Another stunning example of the quality and style available from the Trisha Yearwood Home Collection. 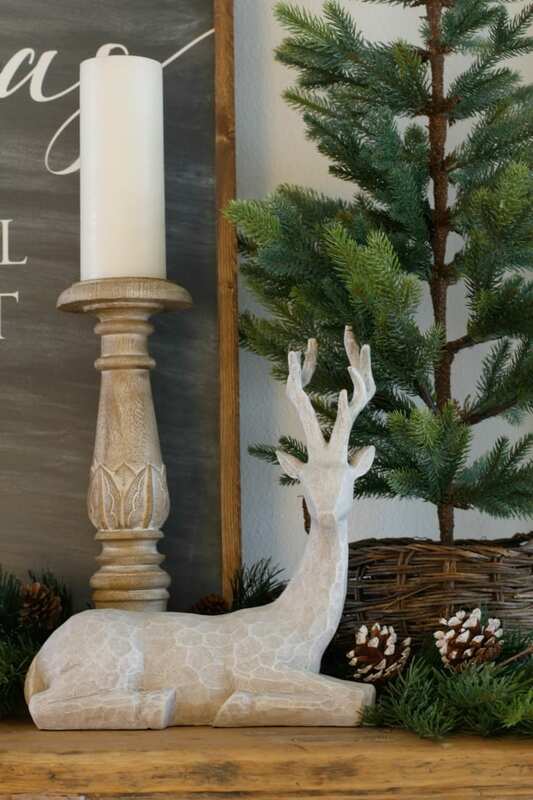 My front hallway farmhouse table came together when I added the pair of gorgeous wooden reindeer–such quality! I know these will be treasured year after year. Find the standing white wash reindeer HERE. And the matching seated reindeer HERE. Jodie always does a wonderful job creating a festive mantle. This year is no exception. 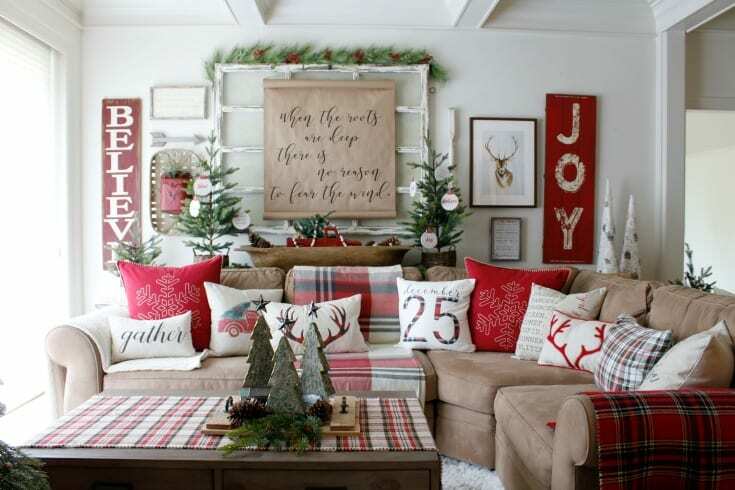 Symmetry, classic items, and just the right amount of detail add up to pure holiday charm. 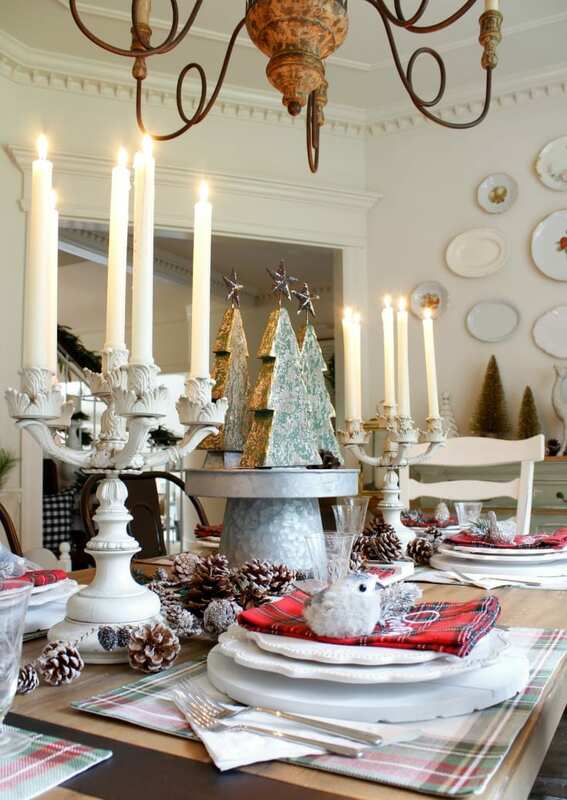 Keeping her milk glass collection for an authentic vintage feel, she added two little snow-covered trees. 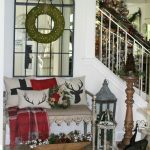 And from the Trisha Yearwood Home Collection she added two of her rustic snowflake lanterns. They fit the mood to a tee: rustic vintage with a snow-dusted look. Plus, the red pops beautifully against her traditional holiday landscape. Shop her red snowflake lanterns. 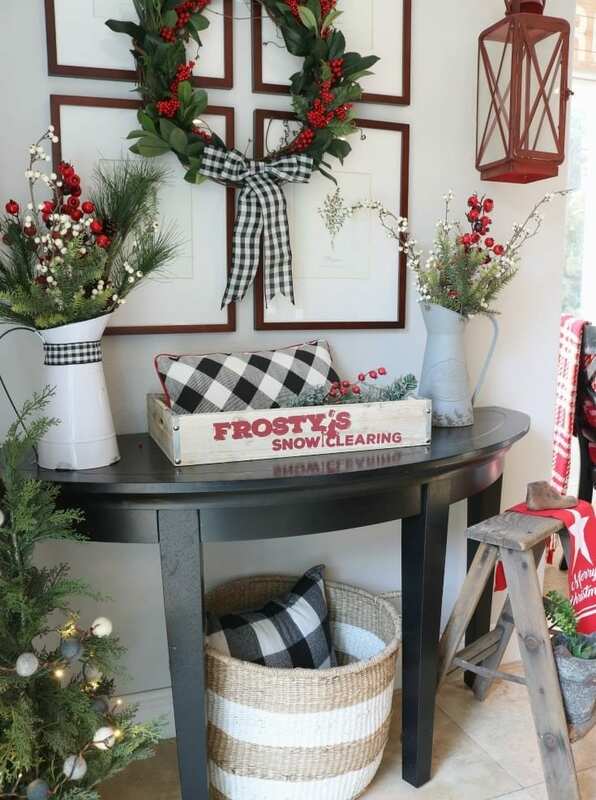 Jodie added a beautiful rustic farmhouse touch to the hearth with her wood and galvanized basket from the Trisha Yearwood Home Collection from Tractor Supply. A warm and festive throw adds color and coziness to her scene. Plus, her family likes it handy for keeping warm on cold winter nights. Shop her basket HERE. Additionally, we love how the style of her metal and wood basket blends beautifully with the surrounding antiques. It’s also decor with a function. Our practical hearts are made very happy when we can blend function with beauty in our home decor. Jodie already owned a lot of Christmas decor. 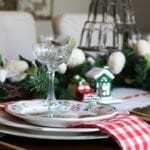 However, adding just a couple new items make it fun and festive. She chose this vintage inspired “Frosty’s Snow Clearing” wood and metal box to add whimsical rustic charm to her Christmas decorating. This is a versatile, authentic-looking box tray from the Trisha Yearwood Home Collection. We can envision using it on a coffee table, on a kitchen island, on a bed, or anywhere you want to create a decorative vignette. It could even function to serve tea or breakfast in bed. Now, that’s an idea…. Shop this adorable tray HERE. There’s so much to love about his time of year. And if you have been following us for any length of time, you know how much we love to decorate. But you also should know how we are budget conscious and practical in how we decorate. We love to use and reuse what we purchase. We love to shop our own homes and use our creativity to make things new. Furthermore, when we shop we look for versatility, value, as well as style. We are just delighted by all three when we shopped Tractor Supply. They have many brands to choose from, so it’s a one-stop shop. 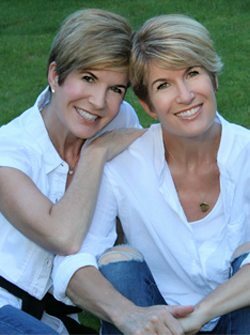 We are particularly excited about their Red Shed and Trisha Yearwood Home Collections. They are full of the rustic, farmhouse charm we love to incorporate in our homes without breaking the budget. You’ll be excited when you see just how amazing the prices are of everything we’ve included! 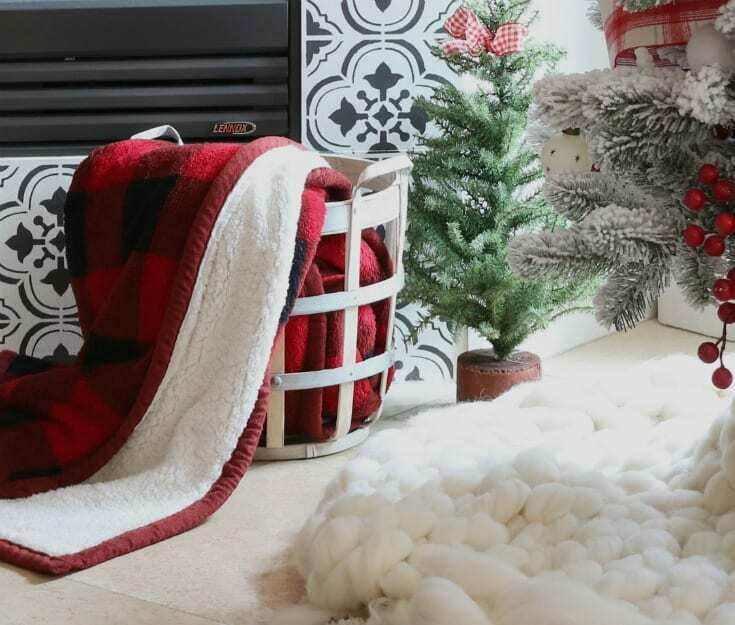 As an added bonus this holiday season, Tractor Supply is offering free standard delivery on all of the products mentioned in this blog, plus all of their other decor items, for a limited time. We hope you have fun exploring your local store or online. Click here to explore their online store. Happiest of Holidays from our Homes to Yours! 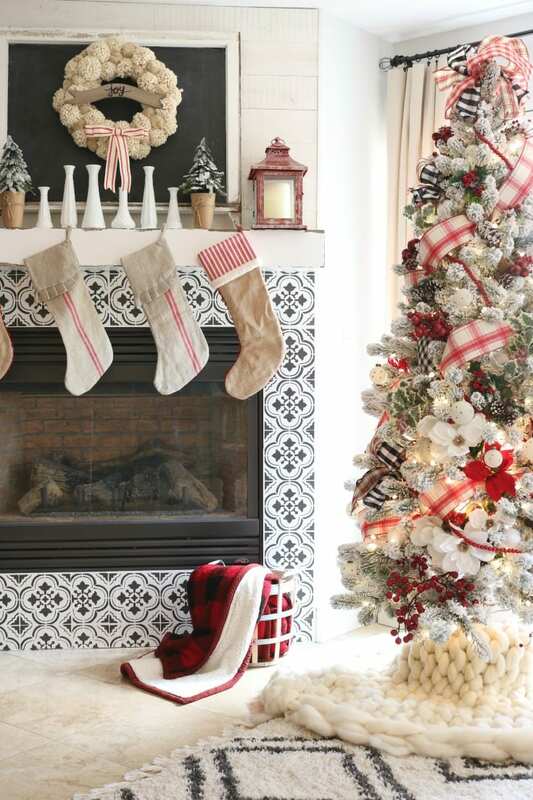 Looking for more Christmas decorating ideas? Visit our other Holiday posts below or use the search bar to find more holiday crafts, recipes, traditions and more. 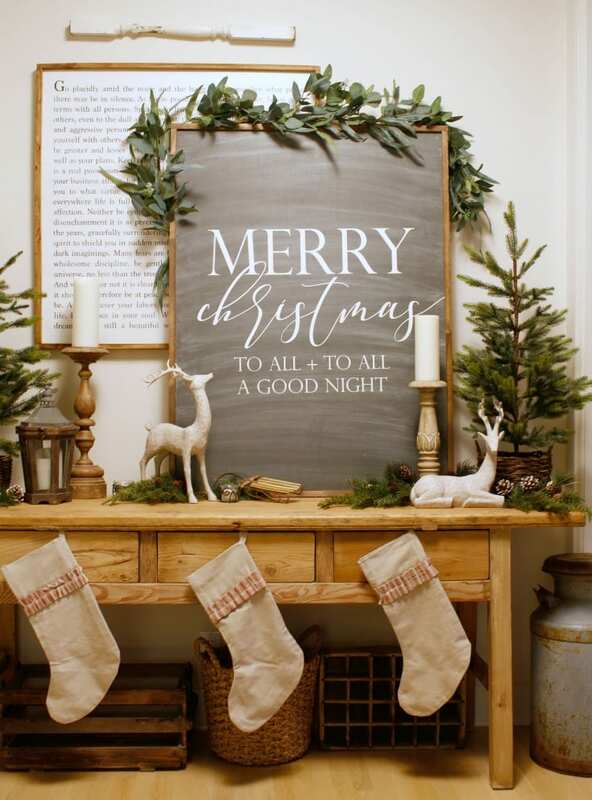 Our best Christmas decorating ideas to create a festive farmhouse Christmas using vintage-inspired decor. 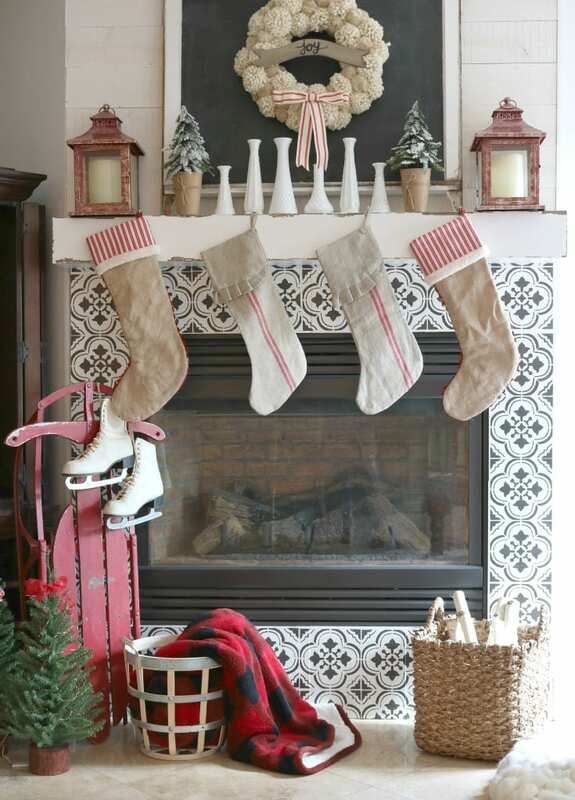 Create the setting for your family's own traditions with festive farmhouse decor. 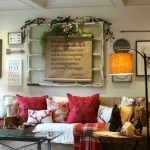 Get plenty of inspiration and sources to shop for your own home this holiday season all on a budget. So F,U.N. Sooooooo pretty… thank you for sharing for homes. I shop TC for bird seed… n.o.w. it will be for T.Y. Decor🌲. That’s so cool! We were new to Tractor Supply and were so excited about their assortment of products, fabulous brands, and great prices! Happy shopping, and happy holidays from both of us!